Scooper - Technology News: What would Brexit mean for Germany? What would Brexit mean for Germany? On June 23, voters in the United Kingdom will decide whether their country will leave the European Union. They alone will cast ballots, but the political and economic impact of a vote to leave (“Brexit”) would be felt across the EU, if not the world. For Germany, Europe’s largest economy, the consequences of Brexit could be grave. Public opinion in the country is divided on the issue. Some fear that the EU would become less liberal if the UK left. Others, resentful of the UK’s presumption that it should be allowed à la carte EU membership, are eager to see the British go. When it comes to the economic impact of Brexit, however, Germany has much to lose and almost nothing to gain. To begin with, Brexit would change the way multinational companies make investment decisions. The UK could face an exodus of foreign firms, as companies seek to retain a presence in the EU. But there is no reason to believe they would necessarily move to Germany; many US multinationals, for example, would likely relocate to Ireland. At the same time, the EU as a whole – and Germany in particular – would become less attractive to investors. The UK would be free to loosen regulations and lower taxes in order to attract investments for which a foothold in the EU is not necessary. This, too, could reduce investment in Germany. Second, while some believe that Brexit would cause Frankfurt to rise in importance as a financial center, that outcome is highly uncertain. Today, London is Europe’s dominant financial center, even though the UK is not a member of the eurozone. This suggests that proximity to the European Central Bank is not an important factor in the success of a financial industry. To be sure, the EU would come under growing pressure to use regulatory measures to take business away from London, but whether that would work is an open question. Already, Deutsche Börse and the London Stock Exchange have announced that a planned merger will go ahead, regardless of the outcome of the Brexit referendum. Even if London’s importance as a financial center does decline, some of the business will be picked up by centers outside Europe, such as New York or Hong Kong. And the business that does migrate to the EU could just as easily be snapped up by rivals to Frankfurt, such as Paris. Third, German exporters are likely to suffer. In 2015, the surplus from trade with the UK topped €50 billion ($57 billion), with German exports totaling roughly €89 billion, or 3% of German GDP. Only France and the United States bought more German goods. Any disruption to bilateral trade would be felt across the country. Exactly how trade and capital flows would be affected depends on the exit arrangements negotiated between the EU and the UK. If the UK were to remain, like Norway and Iceland, part of the European internal market, the economic damage would be limited. Unfortunately, however, this is unlikely. Non-EU countries that have access to the European Single Market are also required to comply with most European regulations – which is exactly why the UK wants to leave the EU. Moreover, some European decision-makers might want to make sure that Brexit causes as much pain as possible, to deter others from following the UK’s example. By declaring its intention to leave, the UK would trigger Article 50 of the EU Treaty, which stipulates a two-year deadline for reaching an exit agreement. If no agreement is signed before the deadline, EU membership simply expires. A minority of 35% of the votes in the European Council would be enough to block an agreement that minimizes the economic costs of Brexit. Finally, Brexit would be a severe setback to European integration. The EU’s remaining members might agree more easily on common policies regarding internal and external security and foreign policy; but, for Germany, it would become harder to champion free trade and oppose protectionism. Currently, the EU contains a bloc of countries – the UK, Ireland, the Netherlands, the Czech Republic, Slovakia, and the Scandinavian and Baltic countries – with favorable views on free trade – that controls roughly 32% of the votes in the European Council. This provides Germany, with its 8% voting share, a pivotal role in economic-policy negotiations. Together with the liberal bloc, Germany can block Council decisions, which enables it to exploit differences between the UK and France and gives it a key role in building consensus. Should the UK leave, the share of the liberal bloc’s vote in the Council would fall to just over 25%, reaching about 34% with Germany – just short of a blocking minority. New coalitions can be formed, of course, but German political influence in the EU would surely decline. 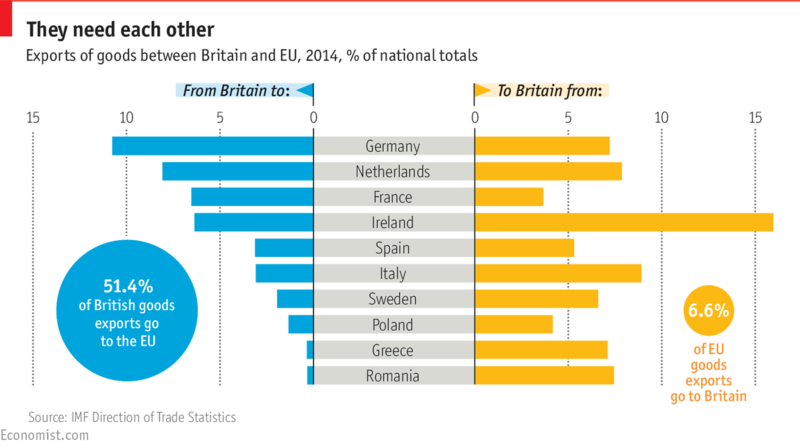 Germany, in short, has a strong interest in the UK’s continued EU membership. British voters have an opportunity to spare themselves a great deal of economic turmoil, while allowing Germans – and many others across Europe – to breathe a sigh of relief.